Ernst Barkmann was born in Kisdorf in Holstein on August 25 of 1919. He was a son of a local farmer. In late 1941, Barkmann was transferred to Holland as an instructor of European SS-Volunteers but in early 1942, he volunteered for service with division's Panzer Regiment. 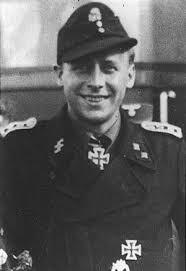 Ernst Barkmann returned to the Eastern Front in winter of 1942 and was transferred to 2nd Kompanie of 2nd Panzer Regiment of 2nd SS Panzer Division Das Reich. Barkmann's unit was equipped with tanks Panzerkampfwagen III with 50 mm guns which were outclassed by Soviet T-34 and others. 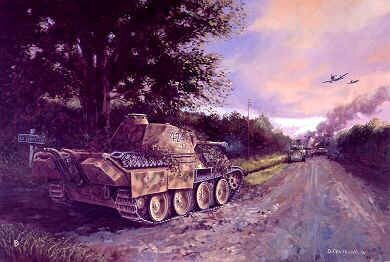 In early 1943, 2nd Panzer Regiment took part in the Battle for Kharkov, where Barkmann won the Iron Cross (First Class). In mid 1943, Barkmann was transferred to 4th Kompanie which was equipped with new Panther tanks. During his very successful career, Ernst Barkmann earned Knight's Cross for his bravery and skills along with the Panzer Assault Badge for 25 and 50 engagements with the enemy. He survived the war to live in Kisdorf, Germany, where he was a long time fire chief and mayor (Burgmeister). Barkmann died on June 27, 2009, at age 89. Thanks much Tank! I have always had an interest in Germany, especially the WWII period. It is simply a great country with a great people and amazing history. The German food I have had is fantastic too! My mother's side of the family originally came from Germany. This particular article is not of my writing (which I cite the reference/writer/website where the original can be found). I like to put up the history stuff on armoured warfare, tanks, battles, and the men and women who fought in them, rather than talking about the technicalities of Tanktastic, which other people far more qualified than myself, can better articulate. I have read a good deal on the subject and find it fascinating. I'm reading a book about the German viewpoint of Operation Market-Garden in the book, "It Never Snows in September, " by Robert Kershaw. A very good book. That is really cool that you have a great grandfather that served and commanded a Panther tank/crew (I'd love to hear more about that! ), as well as your great grandfather knowing Peiper. I have a huge book on Peiper's life called,, "Jochen Peiper, Commander PanzerRegiment Leibstandarte," by Patrick Agte. It is one of, if not the best book on Peiper's life. Anyway, I hope to put some more things up on the people, vehicles, and battles associated with armour. I would like for people to see that there is such a rich history and tradition of brave men and women behind it all. RESPECT!You know more than me ?! And Wow i like your topics there are interessting. Toadtoad,du machst dich hier nur lächerlich.. Thanks again Tank! I'm glad you like what I'm posting; I have other ideas for topics on the Tanktastic forum. I really like the stories down on the individual soldier's level, you know as seen through their eyes and experienced by them. The tactical stuff is interesting too, but the personal human factor is what really makes it so enthralling for me. So, I always like to read books and articles on the common soldier. Yes, I have read some on "Wacht am Rhein." In fact, I knew an US Army veteran, now deceased, who was encircled by German forces at Bastogne. The German forces came very, very, close to turning the the tide of the war with that one. An interesting thing I found, after recently reading Volker Griesser's book, "The Lions of Carentan, Fallschirmjäger Regiment 6, 1943-1945", that the Germans actually did an airborne operation and dropped paratroopers, among them FJR6, as part of the surprise offensive. I would be interested to know of what division your great grandfather was a member. Much respect to your great grandfather for his courage and sacrifice for his country. Yes thank you:) But..Sometimes i think on all this dead people who gives her lives in the war..
That's really cool your great grandfather was in the 1st SS Panzer Division "Leibstandarte Adolf Hitler". He was obviously "the best of the best" to make it into the LSSAH. I can imagine the pride you must have for your great grandfather. It is unfortunate he didn't survive the war. Does your family have any wartime pictures of him? It is sad to think of all those who gave their lives honorably in war. God bless them all. Later, Swiss cheese in France. That's great that your grandfather took part in a fight for freedom and the independence of Indonesia. Something that you and your family obviously take a huge amount of pride in. Yes, I looked Ludwig Bauer up just now after reading your post. I remember him now from the show "Greatest Tank Battles" and his experiences commanding a Sturmgeschutz. You are correct there are many tank aces besides the well known ones such as Knispel, Carius, Wittmann, Barkmann, etc. I find Kurt Knispel, to be he interesting. He was highest scoring tank ace of all in Germany or the allies, and wasn't even awarded the Knight's Cross with 168 to 195 tank kills, due his not pursuing awards and humbly diverting credit to others, as well as conflicts with higher Nazi authority. Yes We have guns from him and any pics but there all by my grandma in berlin. And cmerry really respect buddy,you know alot about the tank aces...You rock! That's great Tank that your family has personal items of your great grandfather's. It would be interesting to find some of his fellow soldiers that he fought with and talk to them and retrace your great grandfater's movements in battle. It would be cool to journal all of that. Thanks for your respect and I understand your English with no problem.